Apollo Electronic Cigarettes is a fairly new brand that has come on the market and really made their mark. They offer disposable electronic cigarettes that look like traditional cigarettes and have nice packaging and seem to give confidence of a good quality e-cig. They did not try and over complicate the design or put any spin on the electronic cigarette. They come in clearly labelled, slick looking packaging that lets you know all the information you need to get started. 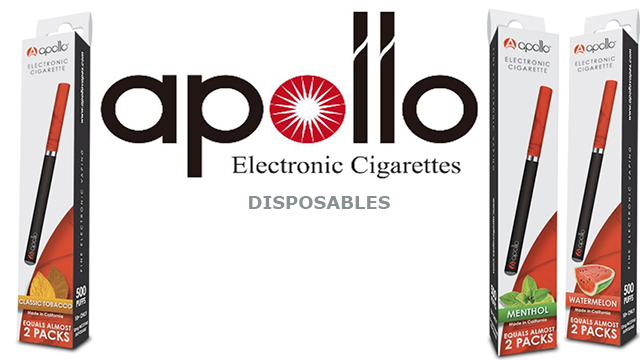 The Apollo Disposable e-cig is rated for 500 puffs, equivalent to 2 packs of tobacco cigarettes. The disposable e-cigs look very nice. We had to review the Apollo disposables again, as the first review was done using an older model of the Apollo disposable e-cigarette. Turns out Apollo did improve on these and the new ones we’re much much better. This probed us to re-write our review. First things first, vapor is much better than it was. The disposables now provide a satisfying throat hit and the flavor of tobacco and watermelon is really good. The flavor and taste does diminish quickly from being very bold to gradually being less tasty. I would say at the half mark, the taste is very much weaker than the first 200 puffs. This is generally the same with disposables and cartomizers in general and we did not expect them to have strong bold taste the whole time. With that said, if we compare to competition, the Apollo disposable is on par. Like many other companies, Apollo offers the consumer limited options in regards to flavor. They have three different flavors available at the time of printing, with Apollo Classic Tobacco, Menthol and Watermelon with 1.2% nicotine volume. 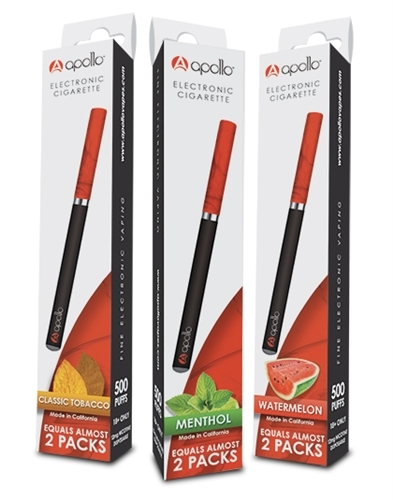 Usually, you don’t get a third flavor with disposables, and watermelon is my favorite, so props to Apollo E-Cigs for that. Now that they have much improved the disposable model, we can suggest users to try them out without worry that it will be utter disapointed. When it comes to their Apollo E-Go Electronic Cigarettes, it’s a different story, the cost value and quality product is much better. E-Go Electronic Cigarettes are a step up above traditional e-cigarettes by offering longer battery life and clearomizer tanks. Apollo has a full line of products of every type that is sure to offer something to everyone. Apollo Disposable electronic cigarettes are offered at $9.95 each but are being sold at promotional price of $5.96. Although we really enjoy their rechargeable models and flavors, we still advise the rechargeable models as being the best option. Apollo advises the disposables are filled with their own proprietary e-liquid made in California, and that is one of their strong points. Having their own development team constantly improving on their product line is always a plus. As we had first reviewed these disposables as being mediocre, we can now say they are actually one of the better disposables available out there. However, if you are looking for a long term serious vaping device, we suggest you start by reading our full review of Apollo e-cigs, and if you’re looking for something really powerful, checkout Apollo’s own MOD, the VTube 3.0.